Preheat oven to 350. Lightly grease a 13 x 9 casserole dish; set aside. Cook macaroni according to package; drain. 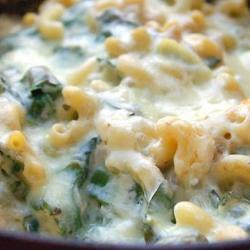 Place hot, drained macaroni in a large bowl and toss with butter and softened cream cheese. Add all remaining ingredients to the bowl and gently mix together well.